When: This Friday, October 17, 7:00 p.m.
Why: The park designers want your input to make this a killer place to ride! Who: All riders interested in gravity/jump/slalom/technical styles of mountain biking/BMX, and anyone else too! Provide Your Input for the New Valmont Bike Park! Come over to The Fix this Friday night to check out preliminary plans for Valmont Bikepark, meet the park designers, give feedback, and learn more about the project. This gathering is focused on the downhill/dirt jump/technical riding elements at Valmont, but all types of riders are welcome to attend and check it out. Plus, there will be fizzy beverages in stock. Don't worry if you can't attend this time, as there will be future opportunities to view the plans for the entire park and give feedback as things move forward. The next chance will be at the BMA Annual Meeting and Party, Nov. 6 at Rocky Mounts. The gravity/technical terrain at Valmont is being designed by Alpine Bike Parks LLC, a professional bikepark and trail building company, in partnership with IMBA. 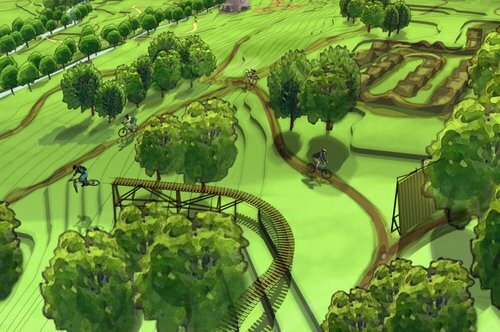 The designers include Judd de Vall and Randy Spangler, veteran riders and park builders of Alpine Bike Parks, and Pete Webber of IMBA. Please bring an open mind, fresh ideas and show up early if you wanna ride The Fix jumps. Check inside the shop for beta before you ride. Are you coming? Drop Pete a quick email at pete@imba.com and let us know if you can. thats sick i wish i could put input on building big trails in my city. I don't like the intersection.2 lines emerging together is where the crash might occurs when riders are concentrating their own lines ahead...all the sudden someone else speeding across in front of or behind you then you know what comes next!!! pritty sick. wish there were more picks.. Yes the jumps do look small considering it's a drawing!!! where is this Valmont Bikepark ?? I want to live in Canada! Sorry... I mean America, wherever this is !